"We've Been Working on the Railroad"
The Byesville Scenic Railway is working to rebuild the old Baltimore and Ohio Railroad's "Eastern Ohio Branch". 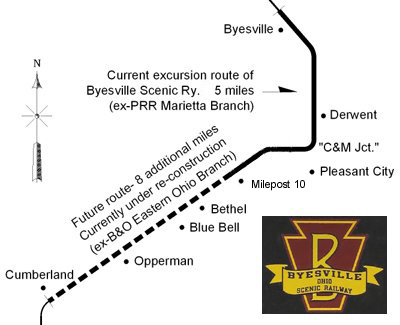 When completed, our excursion train will operate a total of 25 round-trip miles between Byesville and Cumberland. The Byesville Scenic Railway is progressing towards Cumberland, Oh in short increments. Track repairs are both capital and labor intensive. As such, it will take some time before we reach downtown Cumberland, but we are making progress. In 2008 we extended the route of our excursion train one mile beyond Derwent to the State Route 821 (old US 21) crossing just north of Pleasant City, OH. In 2009, we began operating west of the State Route 821 crossing to milepost 10, near the old Banner Mine. This was the first time a train operated over this segment of track since 1993. We are currently working to rehabilitate our track from milepost 10 westward towards the old mining towns of Bethel and Blue Bell, OH. We hope to be operating on this section of track soon.